Razer is seriously trying to shove its thumb into every pie it can. They have a new Smartband on the way, an increasingly popular line of gaming laptops being churned out and even an idea to make desktop PC’s extremely easy to upgrade. 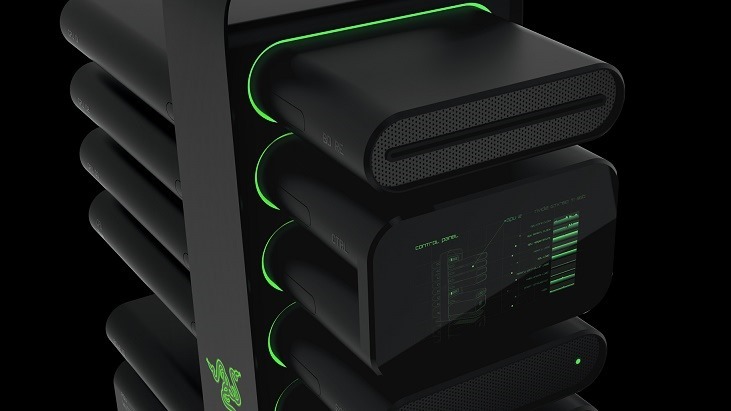 Their modular PC concept, Project Christine, was revealed at CES earlier this year, but it seems like the rather novel idea hasn’t progressed much since then. The idea behind Project Christine sounds simple enough; each of your PC components is encased in its own, individually cooled “segment” that is easy to remove and replace. This gives PC users the freedom to upgrade their rig without having to stress about wiring, cooling and the general mess that is a desktop tower. The idea was also to introduce an upgrade program that allowed customers to pay a monthly fee in order to receive the most recent hardware from Razer, provided you sent your old parts back to them. A new way to think about PC gaming, if you will. The problem is that Razer isn’t getting the support they need from hardware manufacturers, and that’s putting the brakes on the entire project. In a recent interview, Razer CEO Min-Liang Tan expressed concern over whether Project Christine would ever see the light of day. According to him, it’s all up to whether hardware manufacturers decide to back it or not. Despite this, Tan did say that he expects a few announcements to be made during the course of this year, and that Razer is hoping to secure at least three hardware partners for Project Christine. The only bad news is that this means the reality of a modular PC such as Christine is still very far away, especially if hardware partners haven’t even been contractually secured yet. That said, I shudder to think what something like this will cost if it ever gets released. Just something else to add to the growing list of things I’ll never get to hold up close and hug to death. Like Scarlett Johansson.